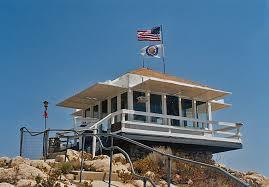 One of only three lookouts remaining on the Angeles National Forest out of a network that once numbered 19, Vetter Mountain Lookout is a very popular visitor site, day and night. The 14’ x 14’ C3 ground house is equipped with steel shutters as protection against vandals. Vetter Lookout was lost in the Station Fire. The Forest Service and FFLA are proceeding with plans to rebuild it.